This post is a continuation of a series of posts about WebGL. The first started with fundamentals and the previous was about translating geometry. I'm going to admit right up front I have no idea if how I explain this will make sense but what the heck, might as well try. First I want to introduce you to what's called a "unit circle". If you remember your junior high school math (don't go to sleep on me!) a circle has a radius. 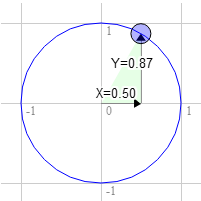 The radius of a circle is the distance from the center of the circle to the edge. A unit circle is a circle with a radius of 1.0. 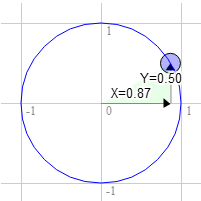 Notice as you drag the blue handle around the circle the X and Y positions change. Those represent the position of that point on the circle. At the top Y is 1 and X is 0. On the right X is 1 and Y is 0. If you remember from basic 3rd grade math if you multiply something by 1 it stays the same. So 123 * 1 = 123. Pretty basic, right? Well, a unit circle, a circle with a radius of 1.0 is also a form of 1. It's a rotating 1. So you can multiply something by this unit circle and in a way it's kind of like multiplying by 1 except magic happens and things rotate. We're going to take that X and Y value from any point on the unit circle and we'll multiply our geometry by them from our previous sample. Here are the updates to our shader. +    // Set the rotation. And here's the result. Drag the handle on the circle to rotate or the sliders to translate. Why does it work? Well, look at the math. Let's say you have a rectangle and you want to rotate it. Before you start rotating it the top right corner is at 3.0, 9.0. Let's pick a point on the unit circle 30 degrees clockwise from 12 o'clock. You can see that as we rotate that point clockwise to the right the X value gets bigger and the Y gets smaller. If we kept going past 90 degrees X would start getting smaller again and Y would start getting bigger. That pattern gives us rotation. There's another name for the points on a unit circle. They're called the sine and cosine. So for any given angle we can just look up the sine and cosine like this. If you put it all together you can rotate your geometry to any angle you desire. Just set the rotation to the sine and cosine of the angle you want to rotate to. Here's a version that just has an angle setting. Drag the sliders to translate or rotate. I hope that made some sense. Next up a simpler one. Scale. Radians are a unit of measurement used with circles, rotation and angles. Just like we can measure distance in inches, yards, meters, etc we can measure angles in degrees or radians. You're probably aware that math with metric measurements is easier than math with imperial measurements. To go from inches to feet we divide by 12. To go from inches to yards we divide by 36. I don't know about you but I can't divide by 36 in my head. With metric it's much easier. To go from millimeters to centimeters we divide by 10. To go from millimeters to meters we divide by 1000. I **can** divide by 1000 in my head. Radians vs degrees are similar. Degrees make the math hard. Radians make the math easy. There are 360 degrees in a circle but there are only 2π radians. So a full turn is 2π radians. A half turn is 1π radian. A 1/4 turn, ie 90 degress is 1/2π radians. So if you want to rotate something 90 degrees just use Math.PI * 0.5. If you want to rotate it 45 degrees use Math.PI * 0.25 etc. Nearly all math involving angles, circles or rotation works very simply if you start thinking in radians. So give it try. Use radians, not degrees except in UI displays.